Which Real Estate Property Title is Right for You? Which Real Estate title is right for you? 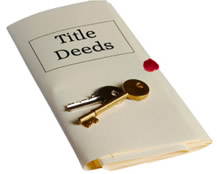 Many home buyers often ask themselves how to take title of a property they are about to buy. You probably heard the expressions Sole Ownership, Co-Ownership and Trust Ownership before. But, do you know which one is right for you? if you are married and wish to acquire title as your “sole and separate property”. In this case, you need the consent of your spouse who will relinquish all rights, titles and interests to the property. Co-Ownership of real property occurs when title is held by two or more persons. Joint Tenancy is an equal interest in a property with right of survivorship. In other words, when people own property as joint tenants, upon the death of one of the co-owners, the title to the property automatically transfers to the surviving owner or owners. There is no probate or other legal proceeding required. However, if either joint tenant transfers his or her share to someone else, it automatically terminates the joint tenancy and converts the title into a Tenancy in Common. Tenancy in Common in which co-owners own undivided interests; Unlike joint tenancy though, these interests need not be equal in quantity and there is no right of survivorship, i.e. following the death of either tenant, their interest will vest in favor of his or her heir(s) or devisee. Community Property without Right of Survivorship which applies to properties acquired by a husband or wife or a registered domestic partner during the marriage other than by gift, bequest, devise or inheritance. In this case, each spouse has the right to dispose of his or her one half of the community property in his or her will to someone else (such as a child from a former marriage or relationship). Community Property with Right of Survivorship: Effective July 1, 2001, California Civil Code authorized a husband and his wife to hold title to their property as "community property with right of survivorship”. Registered domestic partners have many of the same legal rights as spouses and are also able take title in this manner since 2003. Community property with a right of survivorship enable the survivor to automatically own the community property. No probate will be necessary to make the transfer. The process of transferring title to the surviving spouse or domestic partner will be straightforward. As some of you may already know, there are two types of trusts: Living trusts and Testamentary trusts. Testamentary trusts are established through a last will and testament whereas living trusts are created while one is alive. A living trust is an agreement where a trustee holds the legal possession of funds or assets that belong to a beneficiary. One of the key advantages of establishing a living trust is that assets do not have to go through probate, which can be costly and take a lot of time. A living trust can be used to hold title to the property during the lifetime of the trustor, who is also named as the beneficiary of the trust. When the trustor dies, title to the property held in trust passes to the contingent beneficiary named in the trust document. A living trust can also be created by a married couple, with the property held in trust going to the contingent beneficiary on the death of the second spouse.